I have read all of Jane Austen’s novels. Yes, even Northanger Abbey. I’ve also read (and watched!) innumerable spin-offs, sequels, prequels, remakes and reinterpretations that her work has inspired through the years. To say I’m an Austen fan might be an understatement. 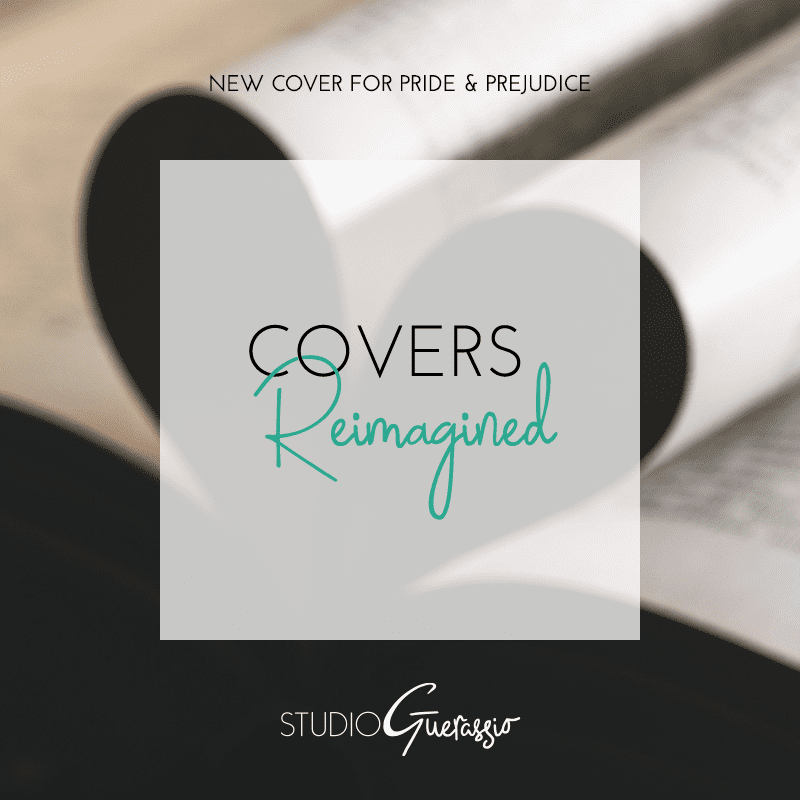 That’s why for this next post in the Covers Reimagined series, I’m tackling a cover for my favorite of her stories: Pride & Prejudice. It’s hard for me to imagine someone might not be at least passingly familiar with this story, but just in case: Pride & Prejudice tells the story of Elizabeth Bennet, one of 5 unmarried daughters in the Bennet family living in rural Regency England. Under increasing pressure to marry, Elizabeth still longs for love and happiness and refuses to settle. 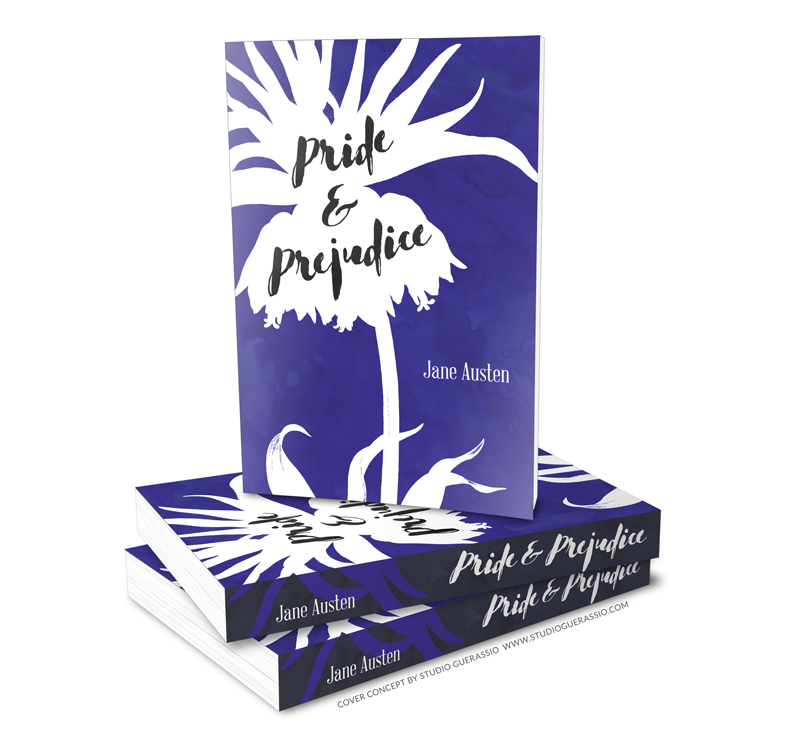 When the outspoken lady crosses paths with the taciturn (and very eligible bachelor) Mr. Darcy*, sparks and misunderstandings abound. Prejudiced assumptions, wounded pride, class differences, near scandals, and the expectations of polite society must all be overcome before the couple finally finds happiness. 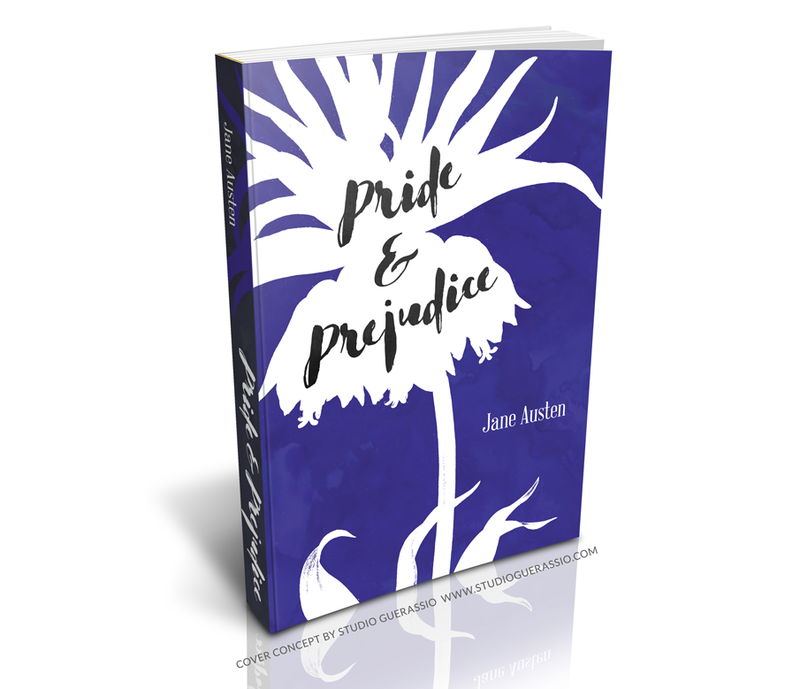 The title is particularly apt, as both pride and prejudice could apply to both main characters. Reversed color scheme on the spine. Brush font for the title, and more restrained font for the author. I did some digging into what colors represent the ideas of pride and of prejudice. Violet was one that came back for pride. Indigo and gray/black came back for prejudice. So I chose to use a purple-y-blue that falls somewhere between violet and indigo, accented with white and a dark grey. I also dug into the language of flowers. The silhouette is of some crown imperials, which is a flower that represents pride. As the story takes place in the English countryside (and our heroine is fond of walks through it), choosing a plant as a graphic image fit nicely. I also added a subtle watercolor texture to the background just for depth and contrast against the flat white of the silhouette. I like that even though this cover is based entirely on photos (my specialty!) it looks like an illustrated cover. The purple color is bold without veering too far from being feminine (it is a story for, by and about women, after all). And I think the brush font for the title captures the sometimes tempestuous emotional nature of the story. Overall, I’m really happy with how it turned out. 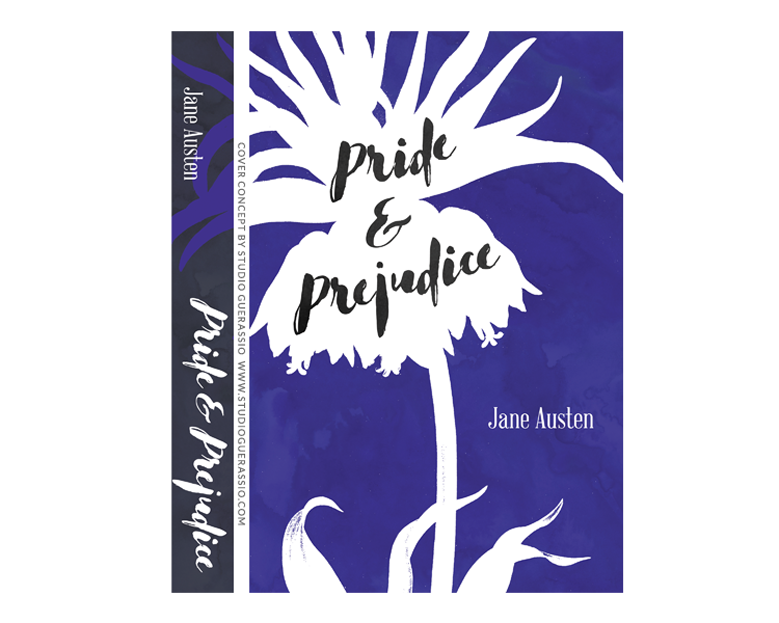 It accomplished what I wanted (a bold, modern cover) while still staying true to the ideas and characters in Pride & Prejudice. What do you think? Does a bold cover suit this classic romance? If you are an indie or self-pub author looking for a bold new cover & more, I have just the thing: The Pageturner design bundle, for everything you need to pimp your book. Image source credits: NYPL Digital Collection. *I’m going to go against the trend here and declare that Matthew Macfadyen is my favorite portrayal of Mr. Darcy. Sorry, Colin.